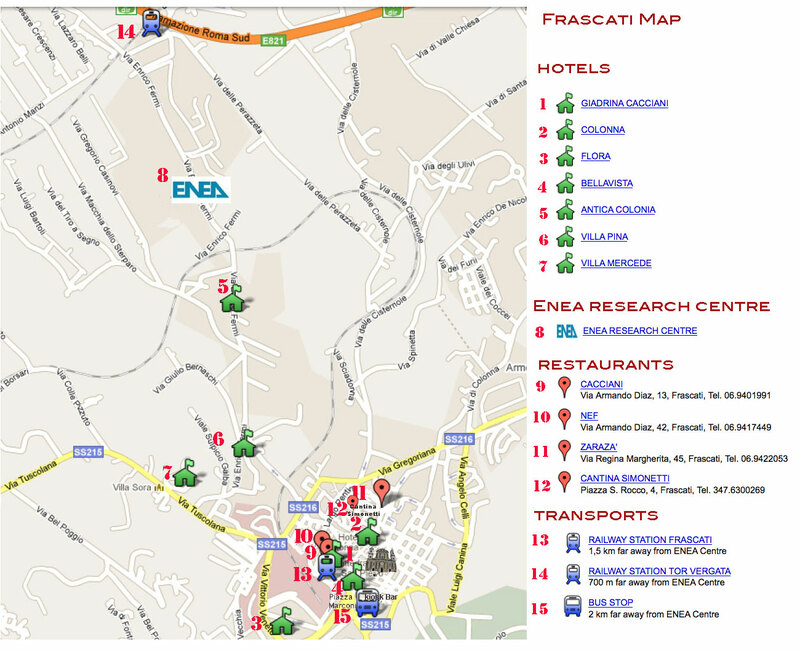 The "Frascati Research Centre of ENEA" is about 2 km from the centre of Frascati (map). From Leonardo da Vinci Airport, you can take the direct train from Fiumicino to Termini railway station which costs € 14,00. It runs every half an hour and takes approximately 30 minutes. Then proceed to Frascati. From Termini Station to Frascati there is a train every hour and it costs 1,90 Euro. Tickets can be purchased at vending machines, ticket offices and other vendors both at Termini and Fiumicino. You can also take a taxi (only licensed white cabs are recommended) to Frascati (30 km, ~ 80 Euro). From Ciampino Airport you can take a bus (Schiaffini Travel or COTRAL) to reach Ciampino railway station and then take the train to Frascati (a train every hour). Transportation from Frascati to the ENEA Centre and viceversa will be guaranteed to the participants by the Local Organizing Committee (see printable Transportation Plan in pdf). Please check here (well in advance of your journey) if you need a visa to enter Italy. If so, ask the Italian Consulate in your country if you need an invitation letter. Here you will find a form to ask for the invitation letter. Please fill in the required information and send it as soon as possible.